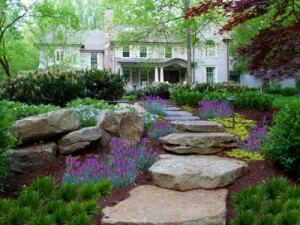 A Landscaping Contractor can help you to choose the right plants for your landscaping project. One of the many benefits of hiring a residential landscaping contractor to help you beautify your home is so that you can ensure that you will have beautiful, healthy plants year after year. There are many factors that contribute to the health of your landscape including choosing the right plants. When selecting plants you must consider factors such as sunlight exposure levels, area weather patterns, plant size, and even factors such as pets or small children who may be active on the property. It is crucial to have the right plants in the right place so that the plants will perform well with little to no additional maintenance from the property owner. Healthy plants that are planted properly are less likely to be susceptible to disease. An experienced landscaper places the right plants in the perfect place so that they will develop healthy root systems and flourish, leaving your yard looking beautiful year after year. At All Seasons Landscaping we consider all of these factors. Our experience and knowledge combined with your ideal landscaping concept will make sure that your plants will survive through the summer and winter months. Here in East Texas, you cannot always expect for the same plants to do well here that may do well in other southern locations. We know the greater Longview and Tyler area weather patterns well, and are able to take your custom plans and advise you on the right plants to make sure your yard looks great in every season. Your new plants will need just the right amount of irrigation. All Seasons Landscaping is an experienced, licensed irrigation installation contractor. We can design the right system that will help you to effortlessly maintain a lush landscape through even the hottest East Texas summer. We install all types of irrigation systems including drip systems, sprinkler systems of all types and more. We are capable of creating a beautiful waterfall or fountain complete with beautiful rock work and hardscaping that will not only make sure your selected plants are thriving through every season, but that will also make you the envy off all of your neighbors. Put the experience of All Seasons Landscaping to work for you. Your landscaping is an investment, let us make sure that it is one that lasts. We are happy to be a landscaping company that services Longview, Tyler, and the surrounding East Texas areas. Call us today at 903-738-0092 for a free quote. We promise you will be glad that you did!